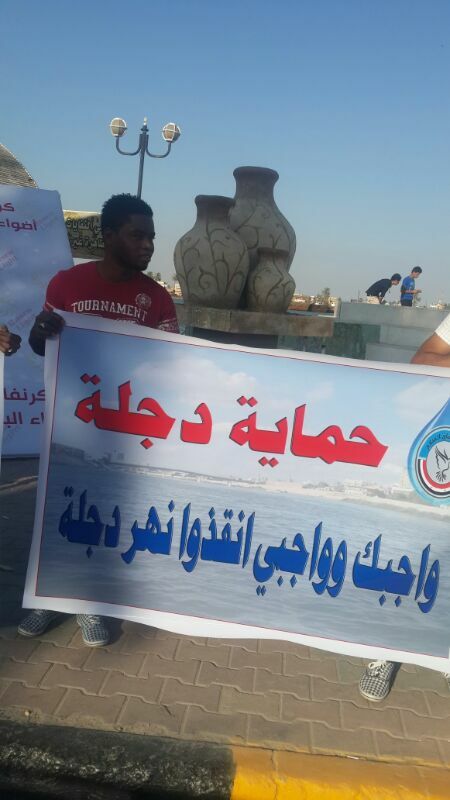 A group of civil activists in Basra, celebrated the World Water Day, on the 22 of March. activists shed light on Iraq’s water problems in general, and the water crisis in Basra in particular. They expressed their concerns over the deterioration of Shatt Al-Arab water and its high salinity. As well as on the future of the Tigris River because of the Ilisu dam, which is being constructed on the Turkish side, and without consulting the Iraqi government. The activists asserted that the responsibility is on all Iraqis, government and civil society for the defense of the Tigris River, raising up the slogan “Save the Tigris River is your duty and mine”, and they distributed a paper containing a legal analysis for the violation of Turkey to the international law by constructing Ilisu dam, as well as raising five key demands, notably the formation of crises team to face Ilisu dam through negotiations with the Turkish side as a first option and the mediation as a second option and international arbitration by approaching the UN Security Council as a last option. The group delivered their demands to the provincial council in Basra and to the governor office of Basra through his two deputies. Activists of the campaign to Save the Tigris River and the Iraqi Marshes contributed in the activity, as well as La Onf group, Al-Firdos Association, Union with engineering professions – southern electricity sector. It is noteworthy that Al-Firdos Association held a seminar last year about the Save the Tigris Campaign and paid the costs of printing banners, and other materials distributed in this occasion, while the chairman of LaOnf Group held meetings with a number of local radio broadcasts on this issue.